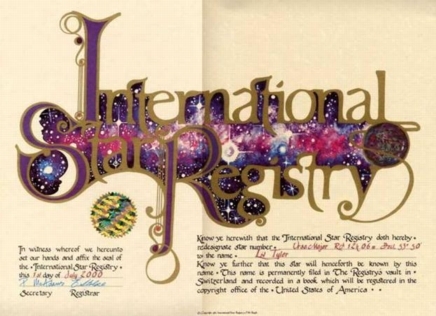 "In witness whereof we hereunto set our hands and affix the seal of the International Star Registry this 1th day of July 2000. Know ye herewith that the International Star Registry doth hereby redesignate star number Ursa Major RA 12h 06m Decl.57 53°50' to the name Liv Tyler . Know ye further that this star will henceforth be known by this name. This name is permanently filed in The Registry's vault in Switzerland and recorded in a book which will be registered in the copyright office of the United States of America."